The Spaniard was a substitute for the first time since his debut season and signed 7 points and 6 rebounds in 18 minutes. Lowry, the best, with 22 + 4 + 5 + 2 + 2. The day arrived that many people could not imagine. Marc Gasol wearing another shirt that was not that of the Memphis Grizzlies. It was in a unique setting, the Madison Square Garden. And before an opponent that gave much more war than anyone could expect. Because the Knicks forced the Raptors to fight the victory until the last minute of the game. The Spaniard was a substitute, something that did not happen to him since December 26, 2008 in his rookie season. 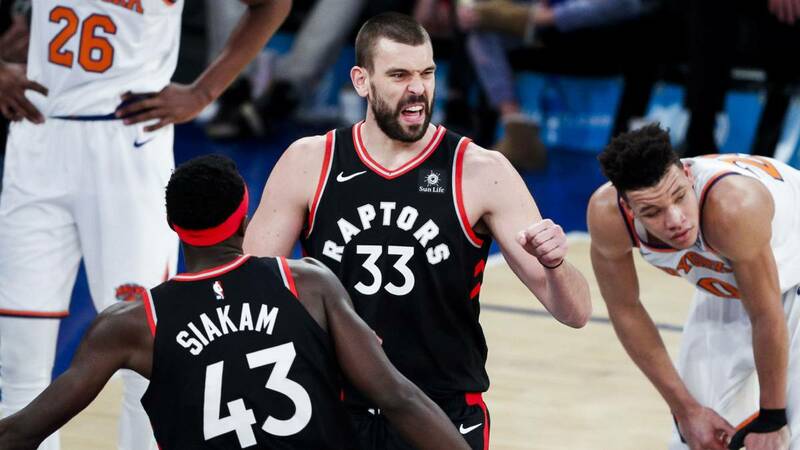 He left with two minutes to finish the first quarter for Ibaka and in the short time he was on court for what is usual in him, and showed some of the things he can bring to his new team. Especially in defense, where he starred in some high level actions. Your first basket came shortly before the second quarter began, when he stayed in a two for two with Lowry as his pair went to close the base. This quickly detected the mismatch and left him with the ball about three meters from the basket for Marc to score with a shot well pumped before the opposition of another defender who had quickly come to the aid of his teammates. At the end of he finished with a little of everything, as is usual in him, in the 18 minutes he was on court: 7 points, 6 rebounds, 1 assists, 2 steals and 1 cap . But while he debuted the New York Knicks dominated the I meet an Dennis Smith Jr. increasingly clairvoyant when it comes to creating game. Since arriving in New York he has not lost 6 assists in any game, a streak that he already brought from his last matches in Dallas. To the 6 basket passes yesterday added 13 points, 4 rebounds and 3 steals. He and Knox (20 + 4 + 2 + 2) were the maximum responsible for the good first local quarter. And although the rest were already losing, they knew how to stay in the game and were almost the last period away from 5 points or less. Kyle Lowry was by far the most toned player of the Canadians. In a very unfortunate match of Kawhi and Siakam (24.9% in shots between the two) , the base brought out the best in his repertoire. 22 points (6/10 in shots, 5/7 in triples), 4 rebounds, 5 assists, 2 steals and 2 blocks. He also had a big blame for the victory on 4/6 in triples by Danny Green. With this victory and the stumble of the Bucks are a game away from the lead. These two teams have no more games left between them and the Milwaukee team won three of the four they played. The Canadians now have six straight games at home with which they will try to hunt down the only team that still resists them in the East.